Rosa Roa first appears in the Painesville, Oho, area in 1935. In America, Rosa Rao was known by her married name, Rose DiCarlo. Rosa Rao, daughter of Antonio Rao and Carmella Milici, was born on April 22, 1897, at Novara di Sicilia. 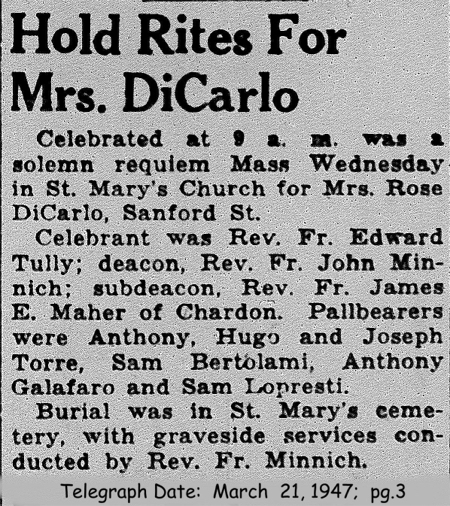 She married Sabastiano DiCarlo sometime before 1923 in Sicily. Rosa died on March 16, 1947, at her home, 315 Sanford Street, Painesville, Lake County, Ohio, at age 49, of liver cancer. Her body was interred at St. Mary Cemetery at Painesville Township, Lake County, Ohio. 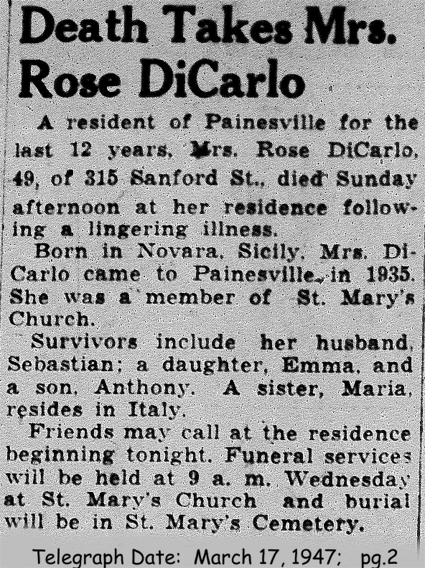 Rosa Rao, age 37, and her daughter, Emma DiCarlo, immigrated to the United States on January 31, 1935, travelling to Painesville, Lake County, Ohio. They were joining Rosa’s husband, Sabastiano DiCarlo, in Painesville. Rosa DeCarlo became a citizen of the United States on August 24, 1944. Rosa resided at 315 Sanford Street, Painesville, Lake County, Ohio, when she was naturalized.